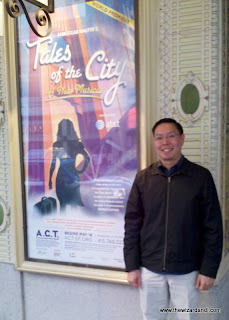 I'm a big fan of Armistead Maupin's Tales of the City (as detailed here), so when planning our recent trip to San Francisco, I just about peed my pants when we got tickets to the final preview night of the musical adaptation commissioned and presented by the American Conservatory Theater. With a tummy full of a so-so hamburger from Lori's Diner, a pocketful of lozenges to quell the hacking cough that has still not yet learned how to quit me, and a very patient hubby by my side, I climbed the several flights of stairs and settled into my (steep) balcony seat in a packed house with much excitement and - in all truth - a little trepidation. How do you capture lightning in a bottle? Firstly, props to ACT for an amazing set design by Douglas W. Schmidt, primarily a three-level structure with moving (up and down) platforms and screens that seamlessly alternated between 28 Barbary Lane, nightclubs, office space, and even a cliff where one seedy character meets his demise. (Or does he...?) The set has the perfect combination of sparseness yet believability, and was well-suited to the production. Of the cast, my favorites included Judy Kaye (Anna Madrigal), Mary Birdsong (Mona Ramsey), and Wesley Taylor (Michael "Mouse" Tolliver). I thought that Kaye really captured the "den mother" aspect of Anna Madrigal, and, frankly, was as much like Olympia Dukakis from the TV adaptation as I could have wanted. And I thought that Birdsong was the free-spirited Mona to a T (including revealing her boobies on stage), and Taylor was thoroughly believable as the eternally lovelorn/lovesick Michael. That being said, theirs were not the strongest singing voices (although Birdsong was pretty good overall). I thought that honor went to Betsy Wolfe (Mary Ann Singleton), who has a big brassy voice, albeit a little thin in the upper register, followed closely by Kathleen Elizabeth Monteleone (DeDe Halcyon-Day). But, IMHO - and even though I desperately wanted to like it - the weak link to the show is the music itself. Librettist Jeff Whitty and composers John Garden and Jake Shears of Scissor Sisters did an admirable job of crafting songs that fit the story, but I felt that it generally fell flat. When I see a musical or a concert of any sort, I want to leave humming a tune, grabbing onto a melody. But nothing from this show really stuck for me. Maybe I'll feel differently if they release a cast recording in the future and I can listen to it again and perhaps come to appreciate it more. Maybe I was thinking that it would be like Wicked, and I'd immediately fall in love with it. Or maybe I was just expecting too much. Still, I thought it was a good show overall, and captured the essence of the first book of the series (and parts of the second), even with some artistic license. (AfterElton has a good review here.) 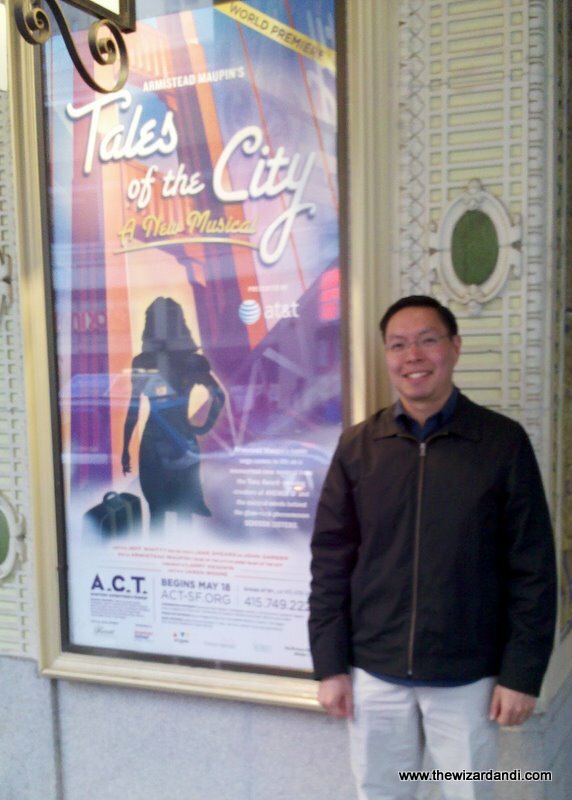 The hubby and I had a good discussion following the show about the viability of the production in other settings; that is, could a show that is as geographic-centric as Tales do as well in other parts of the country, even Broadway? With some tinkering and tightening up of the music, I think it could. What has always drawn me to Maupin's stories is how family is who you make it to be - whether blood relative or otherwise - which is the case for many gay men and women, regardless of where you live. So, survey says, go see the show if you're in San Francisco - it's been extended to July 24.